Editor’s note: This is the fifth of a series of stories looking at how climate change is expected to affect the Great Lakes region. In 2015, Michigan’s Crystal Mountain Lodge was saved by an unlikely rescuer: summer. For the first time, strong summer business bailed out the northern Michigan ski resort due to the previous mediocre-at-best winter. That’s a recent development for the resort and representative of the volatility of an industry facing the impacts of climate change. There’s more. The relationship between weather and visits to the North Shore region in Minnesota was recently analyzed to see how it impacts how people decide to spend their time. Factors like heat waves, fire risks, flooding, precipitation, ice thickness and snow depth all harmed attendance, said Mae Davenport, an associate professor in the Department of Forest Resources at the University of Minnesota. The economic importance of tourism to the region was $220 million to $286 million during the summer, according to Davenport’s study. While those numbers reflect only one region, the weather variables determining visitation are not unique. The variability in daily weather makes it difficult to turn a profit, Lawson said. 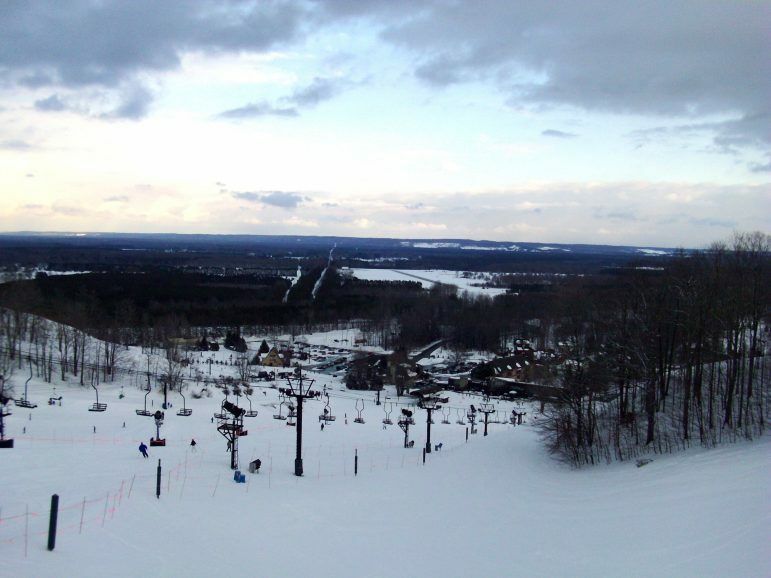 The ideal ski season for winter lodges would begin Thanksgiving Day and close the first week of April, said Pete Meyer, general manager of the Caberfae Peaks Ski Resort. Snow would be made in early November and be done by Christmas. From there, a reliance on lake-effect and natural snow would build on the artificial snow that would last for the rest of the season. “We depend very heavily on snowmaking, as do most ski resorts in northern Michigan,” Meyer said. The reason for Caberfae’s heavy investment in snowmaking can be traced back to a bad winter in 2006. Even though the resort has been blessed with good winters since then, Meyer said snowmaking is an essential tool for remaining financially stable. Opposite to the ski resorts that rely on winter to stay financially afloat is Beaver Island. The island in northern Lake Michigan is a tourist hot spot in the summer. For Steve West, the executive director of the Beaver Island Chamber of Commerce, it’s the state of the economy, not the environment, that determines seasonal success. West anticipates any climate change impacts on the island would be positive. “If climate change means summers are going to be longer and warmer, I would think that would be beneficial for a place like Beaver Island,” he said. But climate change worries push cold weather tourist businesses to find ways to become more resilient. “January will be the month that local businesses and tourism professionals will want to think about how to adapt and provide opportunities for visitors that are weather resistant,” said Davenport who produced the University of Minnesota study. Her team developed a model based on historical data from 2002-2014 that predicts tourism numbers in the region. January is expected to be hit hardest, with a 28 percent reduction in visits due to climate impacts. And an industry that operates against the uncertainty of weather is already making arrangements. Caberfae has 60 weddings planned for summer 2017. Fifteen years ago, that was an income source it hadn’t tapped, Meyer said. Crystal Mountain built a 13,000-square foot spa that is open no matter what the weather. An $11 million hotel is in the making that will run on geothermal energy. Solutions like these are long-term strategies for lodges. “It seems as though, in the last three or four years, the anomaly has been the norm,” Lawson said. If the two-week Christmas break hits a warmup period, Lawson said that could hurt the rest of the year. Juggling those variables has made adaptability a necessity for the industry if it’s going to continue making money. “If you have a bad winter, in some cases, that can drive you out of business,” Davenport said. It is not just the weather, but the climate that is on the minds of the businesses and of the customers with whom they engage, she said. Tomorrow: Five things Michigan does to get ready for climate change.